Disney’s Magnolia Course Hole 1: The first hole of the day is a medium length par four with a typically tight drive that must find its way between the heavy trees / hazard left and the small creek to the right. From there, the green slopes away from the middle and has bunkers guarding it on several sides. Disney’s Magnolia Course Hole 2: This short par four is a dogleg right around a series of trees. 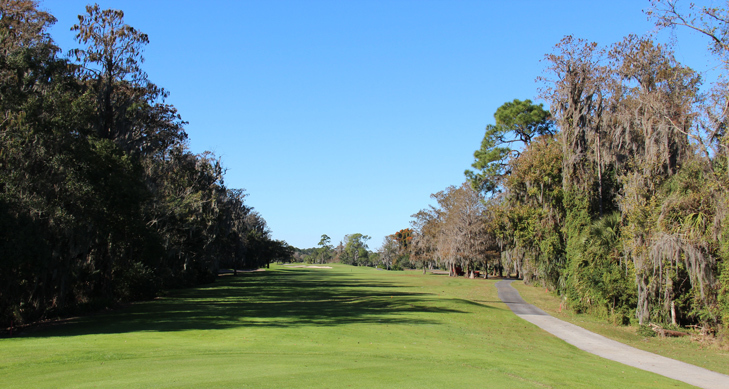 A drive to the right side of the fairway will provide a slightly better angle and shorter shot, but there is limited reason to flirt with the trees that will block anything going too far right. The green is shallow and well-bunkered. Disney’s Magnolia Course Hole 5: This long dogleg right par four has a drive that must find its way between the bunkers left and the heavy trees to the right. The right side provides a short way to the green but will leave a more difficult approach over the big front bunker and big magnolia tree to the right of the green. Disney’s Magnolia Course Hole 7: Like many of the water hazards on the Magnolia course, it would take a pretty big pull or an otherwise awful shot to find the water off the tee, but the view of the hole and water is pleasant. The approach is to a green with multiple bunkers and significant slope yet again. Disney’s Magnolia Course Hole 9: The closing hole on the front nine features a tight drive with heavy trees on either side of the fairway. The approach must then contend with water to the left of the green and multiple bunkers. Disney’s Magnolia Course Hole 11: This short par four has water to the right of the landing area and unforgiving tree-filled jungle to the left of the main fairway bunker. The second shot will then be played over a creek to the most severe putting surface on the course. Disney’s Magnolia Course Hole 14: The player can lay up off the tee or opt to fly the bunkers on the corner of the dogleg to the right. If the driver is hit and pushed, it will find trees or maybe even lake and, if pulled, it will also likely find trees. The player will then have to decide whether to lay up short of the water in front of the green or try to get aggressive, if they cut off enough of the dogleg. Disney’s Magnolia Course Hole 16: A bit of a breather hole on the back nine, the only real trouble is the water hazard, but even that is not really in play off the tee and will only find a poor approach shot. Disney’s Magnolia Course Hole 17: The best hole on the course is this water-filled long par four. The farther left the player opts to hit their drive, the shorter the approach, as long as they clear the water and avoid the trees. Going too far right, however, will bring bunkers and swamp into play as well. The green is then apparently open, but there is a lake to the right that is hard to see from the fairway. Disney’s Magnolia Course Hole 18: The happiest place on earth would want you to finish your round strong, right? Wrong! The last hole is a par four over 450 yards with thick, nasty trees on either side of the fairway, and a bunker-invested approach shot awaits the golfer too.